The all new Samsung Galaxy J3 Star smartphone is found listed on T-Mobile’s website with full specifications and the latest Android 8.0 Oreo OS. Earlier this month, Samsung had launched the Galaxy J3 (2018) smartphone alongside the Galaxy J7 (2018). The same smartphone has been introduced as Galaxy J3 Star moniker in the U.S. and it is exclusively through T-Mobile. T-Mobile has confirmed through the official support page that Android 8.0 Oreo with baseband version J337TUVU1ARDL will be available on the Galaxy J3 Star. The below screengrab shows that Android 8.0 Oreo will be available as launch software on the smartphone. 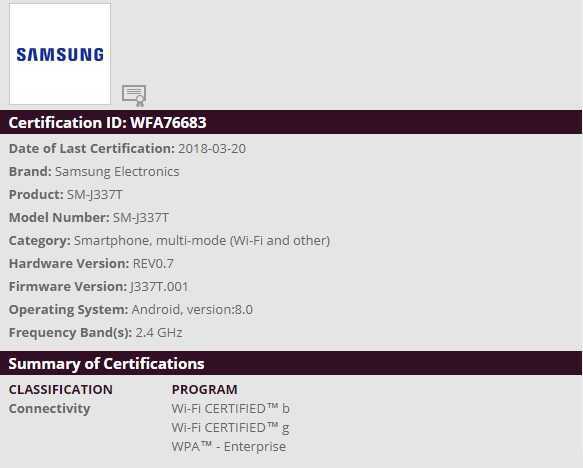 The Galaxy J3 Star moniker was trademarked earlier this year and the handset was also spotted receiving certification from WFA Alliance in March. The Galaxy J3 Star features a 5-inch display that supports HD resolution of 720 x 1280 pixels. The Exynos 7570 chipset powers the phone along with 2 GB of RAM. It has an inbuilt storage of 16 GB. For additional storage, it is equipped with a microSD card slot. It features a rear camera of 8-megapixel and a front-facing camera of 5-megapixel. A battery of 2,600mAh capacity can be found under the hood of the phone. Previous Previous post: Sony H8416 Smartphone Spotted on GFXBench with Flagship Specs; Could it be Xperia XZ3?